Inspired by the design & sound of the old Burns Tri-Sonic® Pickups but with a modern, fatter twist, my Mustang / Duo-SonicSonic '60s have been created to fit a standard scratchplate & cavity with no modifications needed. 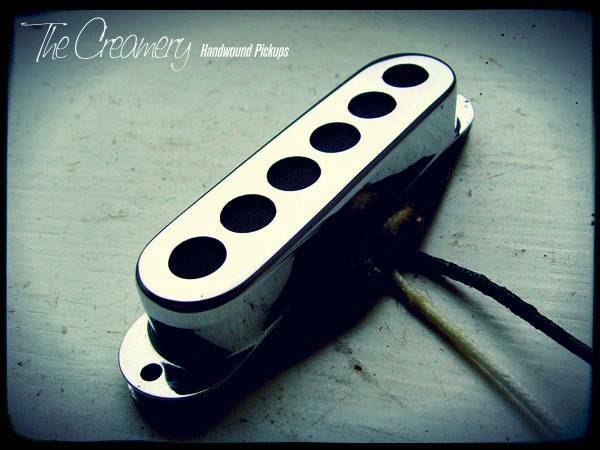 With custom tooled chrome plated covers drawn from thin brass and custom ferrous steel baseplates, my Creamery Sonic '60 pickups really do give a rich, versatile, warmer Mustang / Duo-Sonic sound. Inspired by the design & sound of the old Burns Tri-Sonic® Pickups but with a modern, fatter twist, my Strat Sonic '60s have been created to fit a standard scratchplate & cavity with no modifications needed. With custom tooled chrome plated covers drawn from thin brass and custom ferrous steel baseplates, my Creamery Sonic '60 pickups really do give a rich, versatile, warmer Mustang / Duo-Sonic sound. Geometry dictates they won't sound identical to the old 60s classics as the pickups are smaller (standard Strat / Mustang / Duo-Sonic size) and I use my custom made thinner magnets inside the pressed coil, but they do have the richer voice you'd expect. Unlike the larger originals, my Sonic '60 pickups have been designed to fit a standard scratchplate & body cavity but with outputs of 7k & 6.3k respectively - created to balance the old vintage sounds with a modern spin they have a richer, warmer, more rounded, musical voice than a standard Mustang / Duo-Sonic pickup set.